Sheikh Zakzaky and his wife’s health are critically deteriorating and both need to be visited and cured by physicians, Sheikh Adam Suhu noted. Leader of the Islamic Movement in Nigeria (IMN) Sheikh Ibraheem Zakzaky and his wife are in a deteriorating health condition, a senior member of the movement said. "Sheikh Adam Suhu a member of the IMN said that unfortunately, Sheikh Zakzaky’s left eye has lost vision as a result of Nigerian army's attack two years ago and now he has a problem in his right eye" Tasnim News reported in an exclusive interview. Sheikh Zakzaky and his wife’s health are critically deteriorating and both need to be visited and cured by physicians, he noted. Sheikh Adam Suhu said in the meantime that this country’s government has prevented physicians from providing medical help for Sheikh Zakzaky. “(They) do not allow us to bring them a physician to cure them,” he added. Sheikh Adam Suhu said that the government is afraid of Sheikh Zakzaky release because he may reveal what happened to him and his followers. 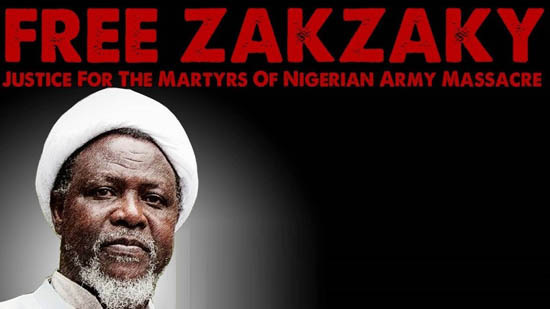 The Nigerian figure underlined that members of the IMN and Sheikh Zakzaky followers will continue holding protest rallies across the country in support of their leader’s freedom. In early December 2016, Abuja division of the Federal High Court of Nigeria ruled that Sheikh Zakzaky and his wife Zeenat should be released unconditionally. Justice Gabriel Kolawole said the court had come to the conclusion that the Shiite cleric and his wife "have been kept against their desires, thereby resulting in the breach of their rights to liberty." The judge also stated that he had ordered the "immediate release" of the two "because the family house in Zaria was destroyed between December 12 and December 14, 2015."